Grandpas are very special people in our lives. This new picture book is a celebration of grandpas and their connection with their grandchildren, and reminds us of the magical moments they share. 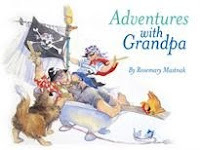 Adventures with Grandpa was written and illustrated by Rosemary Mastnak, and published by Hardie Grant Egmont (2010). When a little boy goes to play with his grandpa, he knows there are adventures in store. Will they build a racing car, or battle a scary dragon, or float away in a hot-air balloon? Adventures with Grandpa is a delightful romp through the secret worlds that grandparents create with their grandchildren. My grandfather had a "bloke's shed" like the one in this book, a special place I remember as a treasure trove of "stuff". We kids loved to search inside for the bits and pieces of glue, wood and paint we needed to build billy-carts and cubbies. In our minds, we were building vehicles that would win the Billy Cart Derby, or rocket us through space. How wonderful to think of kids everywhere having this special connection with much-loved adults! There is a gentleness and softness to this book which I loved. Mastnak's beautiful water colour artwork is perfectly suited to the spare rhyming text she uses. There is so much to see and think about on each page, including a gorgeous chook that somehow manages to include itself. But above all, this is a book that evokes feelings. I think youngsters will delight in joining in imaginary adventures with the little boy, and the twinkling-eyed grandfather who is perfectly happy to come along for the ride. Adventures with Grandpa is just the start for celebrating your special grandfather. You could use it as a prompt with kids for making a celebratory something on Grandpa's birthday, Father's Day, or just because grandpas are great. Will they make a card? A poem? A comic? A multimedia presentation? Questions to get kids started might be: What do we know about Grandpa? What is his favourite thing to do, or place to visit? What are his hobbies? What does he like to say to make us laugh? What is special about my grandpa? We also have an appreciated Granddaddy book. 'Grandpa's Hammer', by Ronald Kidd. We also have wonderful granddaddy! Grandparents are very special people, Paula, I agree! This is such a beautiful story, Grandpas are special people! The illustrations are special too. I think Mastnak captured the relationship between the two just beautifully.